Teaching with TLC: Going From Homeschool to "Homes Cool"
Going From Homeschool to "Homes Cool"
(1) School Days no longer need to correlate with your school district’s calendar. Research the minimum days and hours of school required per year in your state. 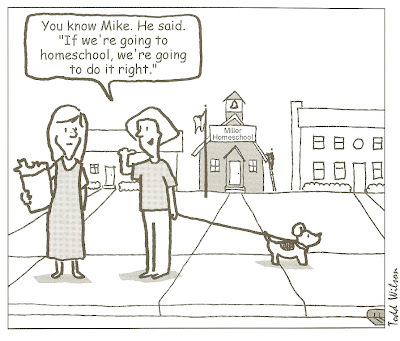 Coordinate your homeschool schedule around your family’s plans. Some families in warmer climates take a long winter break instead of a long summer break while others homeschool year round with several breaks throughout the school year. You are now in control of your schedule instead of a school board so enjoy your freedom. I like to think of myself as the teacher, my husband the principal, and God the superintendent. (2) Just as your homeschool calendar does not need to correlate with your school district’s, your school days and times do not need to match up either. Make your daily routine conducive to your own schedule and your child’s peak learning times. Remember to include learning hours from traveling and in the summer months. Keep in mind that your child learns much more in a shorter period of time when receiving individualized instruction. Do not be alarmed if your child completes his work in much less time than required in a school setting. If this does happen, please do not assign extra work to fill this gap of time. Your child should not be penalized for completing his assignments in a timely fashion. Reward him instead. (3) Work at your child’s own pace. If he struggles with a concept, stop and work on it until he grasps it. You do no need to complete every page of every textbook. Publishing companies always include extra work. If you would like to continue working in a particular book but the school year has ended, insert a bookmark. Just pick up where you left off the following school year. There is no longer a need to rush. Keep focused on your child’s progress. (4) Homeschooling can happen anywhere. Learning is no longer limited to inside four walls. You can go on field trips, take school work with you on vacations or while visiting family, and complete work at a picnic table at the park or outside on a blanket in your backyard. Learning is a special gift that can be opened in any setting. Enjoy learning together as a family!